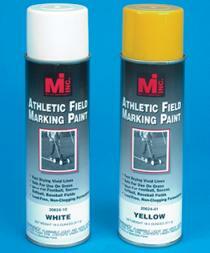 Athletic Field Striping Paint 20 oz. Our 20 oz. water-based paint is specially formulated to not harm grass, yet is not affected by water for maximum durability. Available in white and yellow. 12 cans per box. Traffic Striping Paint 20 oz.